From a solar airplane that can fly for days without a drop of fuel to a NASA rover trekking across the ice, SunPower’s solar products have performed amazingly well in some of the harshest conditions on the planet. While we’re known today for providing the most efficient1 and most durable2 solar solutions for hundreds of thousands of homes and businesses worldwide, many people might not realize that it was one particular adventure in the hot, arid Australian Outback that first put SunPower on the map. It was late 1992 and SunPower, which I founded in 1985 with a handful of Stanford University colleagues, was getting accolades for our solar cell research in Sunnyvale, Calif. Our small team was setting efficiency records even then (19 percent in the lab), but we were primarily academics focused on R&D — not manufacturing. Legendary auto innovator Honda caught wind of what it called our “jewel-like” high efficiency solar cells and asked us to power their racecar for the World Solar Challenge in Australia. Their car had placed second in the 1990 race, and they were determined to cross the finish line first this time. Could a research lab transform itself almost overnight and produce enough solar cells to power a racecar more than 1,800 tortuous miles from Darwin to Adelaide? While a sensible answer would have been, “No,” I said “Yes,” setting the stage for numerous seemingly impossible challenges to come that would push our company to raise the bar and design better solar cells. Little did I know that decision would shape SunPower’s path from research lab to record-setting solar cell maker to solar panel manufacturer and beyond. Today SunPower is proud to design and manufacture complete residential, commercial and utility scale solar power systems around the world. That sleek silvery blue bullet-shaped car, named the Honda Dream, won the November 1993 World Solar Challenge, beating more than 50 other contenders by a full day in the desolate journey and shattering the 1987 record set by General Motors. These days it’s routine for SunPower to provide high efficiency solar cells that power the fastest solar racecars worldwide, including all of the top finishers in the same Australian race, now called the Bridgestone Solar Challenge. 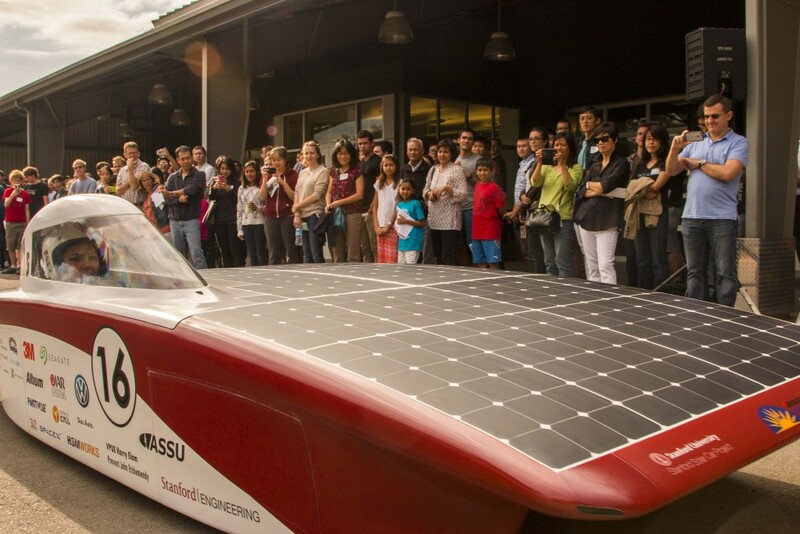 In the 2015 Bridgestone Solar Challenge, our company's Stanford University roots were honored when the university's red and black SunPower-powered Arctan earned sixth place. While SunPower’s company’s history took a few detours like any other start-up, the fundamental spirit of innovation that we established in the Sunnyvale lab almost a quarter of a century ago remains. Generating more than 32 million megawatt-hours of solar electricity combined, enough to power 3 million homes for a year, according to 2015 estimates provided by the U.S. Environmental Protection Agency. Securing more than 600 patents, several of which earned SunPower the U.S. Patent and Trademark Office’s Patents for Humanity award. Completion of the world’s largest solar power plant, the 579-megawatt Solar Star project in Southern California. Completion of the Helix™ platform, the world's first fully integrated commercial solar solution combining solar power production and smart energy management. After the Honda Dream’s success we were inspired to continue our research to drive down the cost of solar, making it more affordable as a clean renewable energy to help power our world. We made our cells lighter, more efficient and more durable to power other record-setting projects, including: NASA’s solar powered Helios, which set an altitude record for the highest flying airplane, NASA’s GROVER, which explored the Greenland icecap, PlanetSolar, the world’s first solar boat to circle the globe, and Solar Impulse, the solar airplane currently attempting to fly around the world. In the coming weeks SunPower will chronicle more of these great solar pioneers’ stories on our SunPower Blog. Click here to get our latest blog post delivered by email. Interested in purchasing the same solar that powered these record-setting solar projects? Use our solar calculator to find out how much you could save going solar with SunPower. © 2016 SunPower Corporation. All Rights Reserved. SUNPOWER, the SUNPOWER logo DEMAND BETTER SOLAR, and HELIX are trademarks or registered trademarks of SunPower Corporation in the U.S. and other countries as well.